“Skittles” is a super cute orange doe that we’re very excited about. She has beautiful color and very balanced type. We love her wide stocky body, chunky bone, short front limbs, her nice full hindquarter, and her beautiful head. We’re very blessed to be able to add her into our agouti program and we look forward to her future litters! 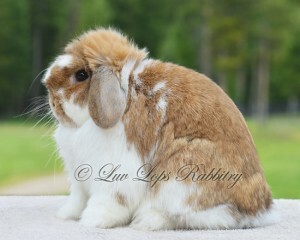 She’s due to have kits by Luv Lops’ Pez any day now! Carries dilute.